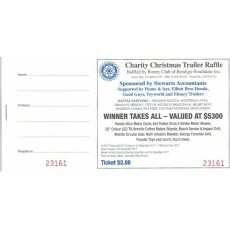 The Charity Christmas Trailer Raffle is run by the Rotary Club of Bendigo-Strathdale. It supports a wide range of charities including Wildlife Rescue, Righteous Pups, Dragons Abreast, City of Bendigo Brass Band, Heart Beat, Bendigo Animal Welfare and the Vietnam Veterans Association. All tickets sold by SPAN, (Suicide Prevention Awareness Network) earn $1 for SPAN which goes to their work in raising awareness of suicide and suicide prevention. Popular Toys and much, much more. Tickets are $2 but online we need to sell them for $2.36 to cover Paypal Fees. All monies collected by Ride4Life will be passed to SPAN for handling with Rotary. Simply complete the purchase. Your name will be with PayPal purchase but make sure we have your address and phone number. You can add these in the comments section when checking out. We will complete the ticket and let you kow your ticket number.